Combining over 30 years of experience with scientific research and development, Bob Reeves has designed a mouthpiece that allows trumpet players to get a dark, warm flugelhorn sound on a trumpet without sacrificing intonation, range, or endurance. The C2J has been used by orchestra players to execute the extreme soft passages in the repertoire and passages that require a dark sound (Mahler, Symphonies #3 and 9, for example). It is also optimal for church settings where a warm chorale type sound is desired. Jazz players use the C2J to get a flugel sound when soloing and when playing ballads. Some find it convenient not having to switch to a cold horn, or even carry a flugel to a gig just to play one ballad. Click here for information from Reeves' Web Site. Marketed as a mouthpiece for trumpeters for use on trumpet as an ad hoc flugelhorn replacement, the Reeves C2J seemed like a potential addition to the wide range of trumpet-sized mellophone mouthpiece arsenal. A specimen was ordered in January 2008 for testing. 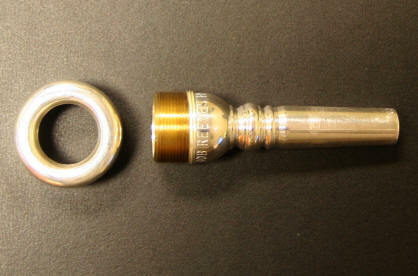 The size selected was 43.5 (equivalent to the cup diameter of a Bach 1-1/4 trumpet mouthpiece). This is equivalent to the current mouthpiece that is being used by the reviewer. The mellophone used for this test was a stock Yamaha 204MS. The C2J received reflected extraordinary quality and precision. This mouthpiece is a screw rim (allowing the rim to be removed and replaced with other diameters or materials). The backbore is short by design which allows it to fit deeply into the venture of the Yamaha, but with a bit more gap than a standard trumpet-sized mouthpiece. The cup is deep. Very deep. The contour of the cup is not V-like, but more like a “Y.” The diameter of the cup gradually decreased and then subtly rounds out into a graduated shaft that feeds into the bore. The throat size appears to be standard, possibly a bit smaller than a 20. In a lot of ways, the mouthpiece is similar to the IYM Kerchner mellophone mouthpiece, except without all the mass of the IYM. Comparing this mouthpiece to two other mouthpieces (Monette STC-2 B2 Flumpet and a Curry TF 1.25) offers a bit of insight into how this mouthpiece responds on a standard F marching mellophone. The tone color of this mouthpiece is dark, round, and compact. It a somewhat muted tone color compared to the Monette and Curry. Not quite the deep tone color you might get using a horn mouthpiece, but it is somewhat reminiscent of a horn mouthpiece with much better projection. Articulations are rounded and not pointed or “brittle” as with the Curry. Almost identical to the much heavier Monette STC-2 Flumpet mouthpiece. The Bob Reeves C2J Mouthpiece is designed as an alternative mouthpiece for trumpet players who don't want to carry along a flugelhorn. The low register (below low C) plays only slightly restricted on the C2J, but the tone quality does change into a flugelhorn-type of throaty sound. It’s hard to describe, but if you’ve ever spent any time on a flugelhorn, you probably know exactly what I’m talking about. It’s not unpleasant at all, but it does differ from the medium range tonal characteristics of the mouthpiece. The upper register articulates great on this mouthpiece. It’s clean and with a nice round characteristic. You can articulate hard on this mouthpiece and it doesn’t lose any quality or get brittle in the least. The Bob Reeves C2J Mouthpiece incorporates a screw rim that enables the performer to use rims of differing sizes and materials. This mouthpiece is flexible in the upper register (middle C up to high C and above). When paired with the mellophone the C2J's slotting is not quite as crisp as the Curry or the Monette. However, the mouthpiece produces a much darker sound than the Curry and maintains a big sounding lower register like the Monette. Overall, this mouthpiece offers a deep, throaty sound that is compact compared to other popular mouthpieces available for the mellophone. Obviously, this mouthpiece was not intended for use on the mellophone (a trait shared with the mouthpieces the C2J was compared against in this article).